It seems that everyone is looking for ways to take the party outside and make their outdoor living experience more enjoyable than ever. In fact, outdoor kitchens are the absolute latest trend in outdoor entertaining. If you love to cook but hate missing the party, it’s time to start thinking about an outdoor kitchen. With an outdoor kitchen, you’ll have the freedom to cook, socialize and enjoy the day — without being cramped for space or starved for sun. Here at Olde Towne Chimney & Fireplace Sales, nothing excites us like planning and designing the outdoor kitchens of our clients’ dreams! Whether you know exactly what you want or you’re at the earliest planning stage, our experts can help! We have extensive experience planning, designing and installing outdoor kitchens, including modular islands, grills, refrigerators and more – just let us know how you plan on using your space and we’ll make sure you’re well taken care of. 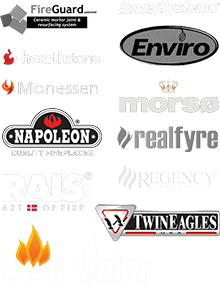 We stand behind all of the products we carry, and are proud to offer Napoleon, Delta Heat, Twin Eagles, American Fyre Design, and FireGear products. Ready to speak to someone about your vision? Give us a call at 812-284-0123 or stop by our showroom today!  You can count on professional service from Olde Towne Chimney & Fireplace Sales for all your chimney, fireplace and dryer vent maintenance.